Mobile Phone Tips and Tricks: How do you clear the chat logs from a Samsung Wave? 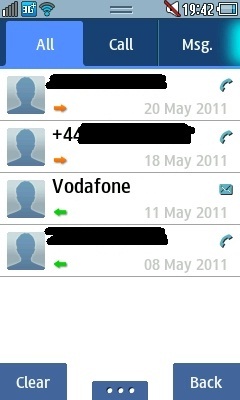 How do you clear the chat logs from a Samsung Wave? This guide for deleting chat logs begins at the home screen which looks something like this by default (though can be made to look very different depending on what you've done to the phone to personalise it). Whilst on this screen you need to press the "Dial key". The "Dial key" is the soft key on the left of the phone under the touch screen and is shown on page 19 of the of the phones manual. You will end up with a screen a bit like this (with out the black marks which have been used to hide numbers of the innocent). This will be a log of the calls and texts you've received. 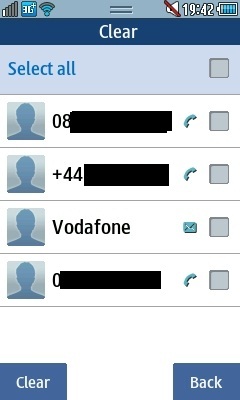 If you've saved the numbers as a contact their name will be displayed here (as seen by Vodafone) otherwise the number will show up. From here we want to click clear in the bottom left hand corner. After selecting clear this screen will pop up and you can either select them individually or select them all. You pick which option suits you, in this case I'll be deleting them all so I'll click on the "Select all" option near the top of the screen. After selecting all, each of the boxes will get a blue tick in them to say they've been selected. 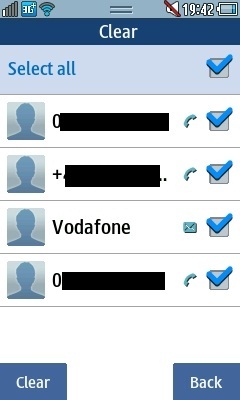 If we click "Clear" again it will delete all of the selected numbers and names so you can clear your call log. The function of this is relatively limited though some folk don't like having a log whilst others just don't see the point in having one, though it can also stop you from accidentally calling someone back, which I'm sure we've all done at least once.